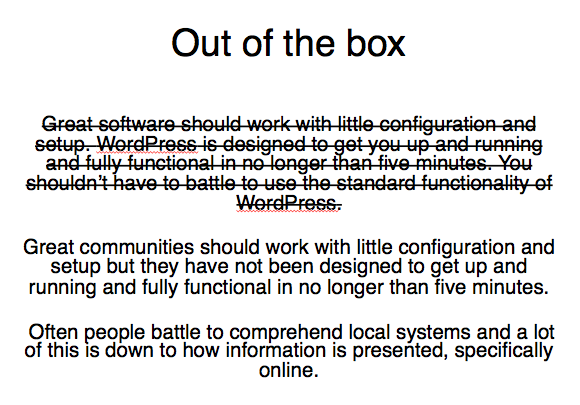 This morning I gave the opening talk at WordCamp Edinburgh. I shared thoughts and stories about how WordPress could be used for civic engagement and local democracy. Below are the slides and some of the things I wanted to say but didn’t quite manage to get out of my mouth. 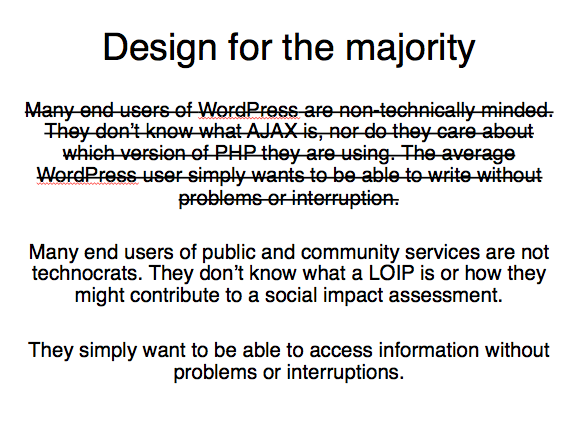 I want to talk to you about WordPress and its role in civic engagement and democratic engagement. By civic and democratic engagement I mean people to people and people to government, elevating voices and the visibility of people to each other. Discoverability for sharing of information, knowledge and for making relationships. I am going to focus on local actions and local issues because they are things you can start doing on Monday. I am not going to talk about politics, party politics or detailed legislation but I am going to share with you some things I know and that I want to pass on, including some ideas we might be able to work on together. 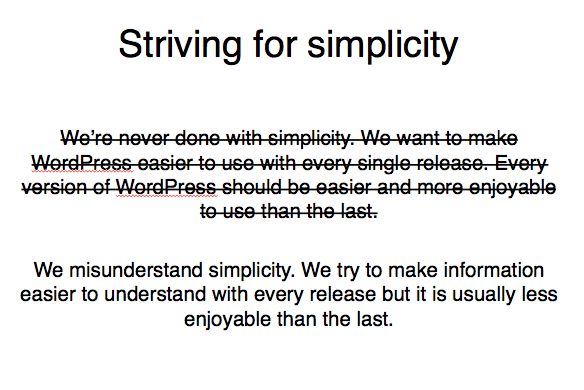 What I know about creating a website on WordPress could fit on the back of a postcard. But that postcard has been sent to hundreds of people in public services and charities and it has been shared by those hundreds to hundreds more. 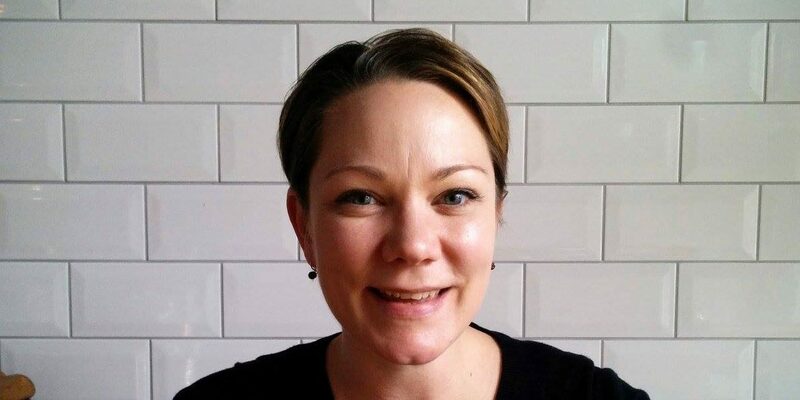 I’ve volunteered and worked for many years with people in my community, this community- Edinburgh- to help them create a presence and a voice online and WordPress is always a first port of call. It’s accessibility from UI to financial is unrivalled and the ethos and values of the open source community are very much in line with those of public servants and people working in/with communities. With basic WordPress knowledge I have been able to bring new skills into my community and into public services and a lot of the time, the people I have helped had no idea creating and managing their own website was in their reach. However, on my journeys I meet people all the time whose lack of resource, knowledge and confidence means they do not know WordPress is an option for them. 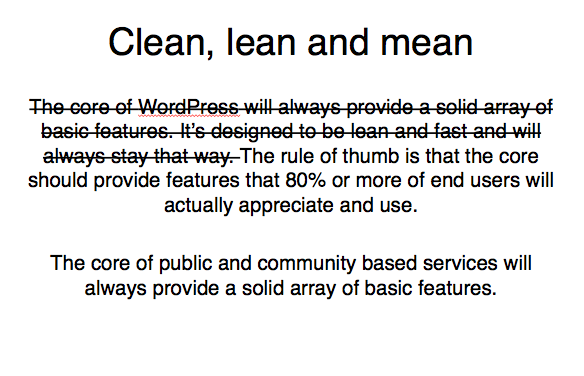 For this talk, I had a go at re-imagining WordPress’s philosophy as if it was written from the viewpoint of someone in our local democratic fabric: a newly elected Councillor, someone volunteering in a community group, someone working in a small charity a school headmistress, a Community Councillor. These two philosophies don’t always line up but we come together in the end- you’ll see. For a few minutes, please use your imagination. There is a lot of altruistic potential in this WordPress community that may be going unrealised because it might not be aware of how it can help or who needs help and what the issues and barriers are to people in our local community to creating a strong online presence that they are largely in control of. Local communities are messy landscapes. Spend some time looking around online and you’ll discover an incredible patchwork of activity and information, not all of it presented very well! In my experience, individuals who are active in their community and small groups in communities are likely to be practically unskilled in creating an online presence for the purpose of providing information, promoting something, having interactions or fundraising. They often can’t take the leap between personal use and ‘professional’ use of the web. The skills needed for deeper planning and thinking about publishing online are not honed so folk are just dumping things online, assuming the internet is magic. Issues of search, even basic user experience, accessibility of information are not considered. Not to be all dramatic and stuff but this is an impediment to local democracy and it’s a threat to creating a local online landscape that is representative because where people and groups are managing to create a presence for themselves, they may be missing the tricks that mean they are found online. Anyone in this room who has worked with any kind of client will have had the experience of having to talk them down from stacks of features and moving parts, miles of text. This is no different out in the community but again, lack of clarity and not considering user need is a barrier to democratising the online space and to local democracy. I’ll go into the democracy bit more later. In my experience, working with people out in the community means helping them zoom out from their bubble and think about why they want to be online and what they would like people to know or do when they hit the website. Amazingly, very few people I have worked with have considered these things before I ask. Again, it’s difficult for people to make a leap between what they do every day (for instance interact with people at constituent surgeries or at play groups) and what that might look like online. As with anyone we work with, guidance and support is needed to do that design thinking, that person centered approach especially because this way of thinking is not a norm and it is not something that is expected of organisations or individuals by funders or the institutions that oversee them. Without interventions and support from folk like you and me, the art of the possible for simple and clean presentation of information online and this is especially important when it comes to information management and legacy information. Sustainability, maintenance and archiving are real sticking points for people and small organisations out in the community. Volunteer turnover, shifting of elected members, poor initial planning and design and insecure funding arrangements means year on year stacking of information on a site, no auditing processes and possibly even the loss of information. While folk might think they are making things simple to find and use by just sticking it online, it could actually be creating a rather messy situation. When I was preparing for this talk, I had some really great conversations with friends in public service, and friends in charities. What came up on more than one occasion is the suggestion that I put the idea out here today that designing with local need in mind is something that may be helpful. Local schools, newly elected Councillors and small charities are left to their own devices with regard to creating websites. Functionally, these people and organisations are the same so in theory designing templates, plugins or packaging up existing themes with extra bells and whistles could be very helpful to them. If you’re designing WordPress tools and templates for ‘social good’, how closely are you working with the users you’re thinking about? If you’re interested in designing for people in our community, can I help link you to them so they can inform your design? It is totally possible that everything these guys need is already out there. At the very least, support in navigating templates, plugins, features to identify what best meets need is something that would go a long way in helping them out. This is the last philosophy and it’s one that both of our communities can agree on. If certain voices aren’t being heard because their information is badly organised and presented online or because they are not online at all, it means they may go unrecognised in the wider community and by elected officials, who should engage with and be accountable to everyone in their local community. This is especially an issue with regard to minority causes or groups. What can we do to help little heard voices be louder? Years ago I helped organise social media surgeries in Edinburgh. These were drop in sessions where anyone needing help learning how to use social media could drop in and spend time with someone who could show them the way. What if we revived these surgeries but changed the focus to WordPress? WordPress surgeries. If you would like to think about this with me, get in touch. 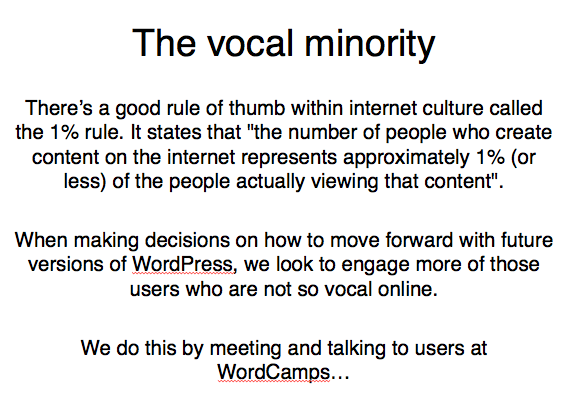 I am making a commitment to get more involved in the WordPress community and to attend WordPress meetups so we can see how we might be able to work together and bridge our communities.